Russia is in the enviable position tonight of trying to convince some of the most recalcitant governments on the face of the earth to accept defeat at the hands of Israel and attend a cease fire meeting. The task has fallen to Russian Foreign Minister Sergei Lavrov, according to AFP. Iran’s President Ahmadinejad has called for the destruction of Israel so often that it is almost impossible to envision him telling Hamas to play like nice children and attend the cease fire summit. Iranian President Mahmoud Ahmadinejad and Syrian President Bashar Assad gave Mashaal their full backing, but significantly, both Egypt and Saudi Arabia boycotted the summit. 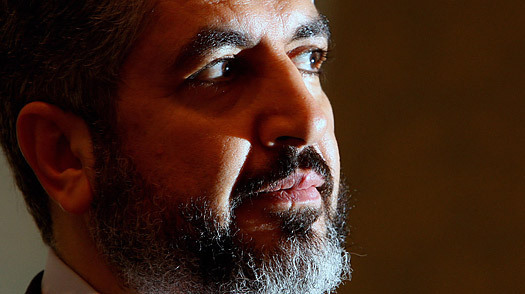 Leader of Hamas, Khaled Mashaal. So, faced with this lovely scenario, Mr. Lavrov is urging all key players to sit nicely and enjoy a cease fire summit. The Gaza militants embrace ‘heroic role’ as bombardment continues. Israeli forces continued to bombard the homes of Hamas leaders on Monday as the war in the Gaza Strip entered its 17th day. So far Israel says that at least 300 militants are among the more than 900 Palestinians killed. But Hamas insists that it has not been significantly hurt – tactically speaking – by the onslaught. Government offices and tunnels have been destroyed. Its leaders are pinned down, unable to move freely or show their faces in public or even communicate on cellphones that can be tracked by the Israeli army. Israel recently killed Amir Mansi, commander of Hamas’s Gaza rocket division, and its stream of Qassams has dropped 50 percent since the assault began. But it is still able to launch rockets at Israel. Has Israel decimated the Hamas leadership – and eroded its support among Gazans? Are its senior political chiefs based in Syria calling the shots and prolonging a battle that war-weary Gazans would increasingly like to see ended? Inside Gaza, relief is needed immediately; rebuilding could take five years. Hamas in Gaza sent a three-man delegation to Cairo to work on reaching a deal. But Hamas leaders from abroad have taken a harder line, indicating that it would rather fight until the last man than agree to a cease-fire that doesn’t meet its demands. Khaled Mashaal, the Syria-based political leader of Hamas and the man who holds more sway than any of the Hamas leadership in Gaza, says that Hamas will only agree to a truce if all border crossings are open. He rejects any new measures to prevent the smuggling of additional weapons into Gaza. You are currently browsing the archives for the Khaled Mashaal category.